Ah, summer…a time for getting outside to enjoy the warm, sunny days with picnics, margaritas and relaxing by the pool…but, what about your PR plans? Summer can be a challenging time if you have PR initiatives that need to move forward. With many reporters on vacation, your media outreach can take even longer than usual. And, of course, the 4th of July is right around the corner. Planning is imperative: Trying to choose the best date for an announcement? Study the calendar. Avoid the major summer holidays, the 4th of July and Labor Day, as well as the days before and after. That is, unless your news has a tie-in to these holidays. If you’re making a tech-related announcement, for example, you’d certainly want to time it so it doesn’t coincide with the 4th to achieve maximum visibility. On the other hand, if your news involves a holiday-related trend, you’d want to pitch that a week or two before the holiday. Allow extra time: As we know reporters may very well be on vacation, it’s a good idea to build in some extra time on pitches during the summer months. For instance, if you usually pitch news a week before an announcement, allow two weeks. That way, if a journalist is out of the office, you’ll still have time to follow up. Avoid the dead zone: Per the point above, as the 4th of July and Labor Day each fall on Monday, you can expect the Friday before to be pretty quiet (you can almost hear the crickets chirp!). Some may even take off the Tuesday after to create an even longer weekend. And, once they return, their inboxes may be filled to the brim with pitches. You don’t want your pitch to get lost in that sea of email, so maybe wait another day or so before sending it. Think Christmas: Believe it or not, it’s not too early to think about the holidays. Gift guides for many print magazines are already in the works. If you have a product that fits in that category, you’ll want to start pitching those gift guides now. Be ready with a product description and high-resolution photos. Cover your time off: Lastly, if you’re in charge of working with the media for your company or client and are planning to take a vacation, have a plan in place should a reporter get in touch during that time. Ask someone to cover for you and be sure to have basic resources ready for them to use if a reporter needs anything. If you have a press area on your site, all of these materials should be posted there (that makes it easy for the reporter AND for anyone trying to cover for you). And, be sure not to leave your clients in the lurch. Give them plenty of notice so you can complete any work they need done before you go. If you’re a consultant leaving for an extended period of time, e.g. more than a week or two, consider asking someone to fill in for you. Perhaps you have a trusted consultant colleague who could be on call, should your clients need anything. 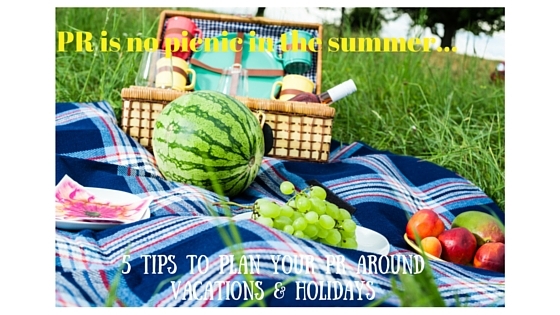 I hope these tips help you make the most of your summer PR initiatives. Now, time to get back to your sunbathing!